Having grown up in Westchester County, about two dozen miles north by northeast of Manhattan, I can tell you that – not only was the New York Metropolitan area a scene of intense fighting (including the single, largest set-piece battle of the entire Revolution, “The Battle of Brooklyn”)… it was also the scene of some very nasty and vicious internecine warfare. Indeed, my home county of Westchester was called “The Neutral Ground” because it was an area of fiercely divided loyalties which pitted neighbor against neighbor – those who supported the Revolution; and those loyal to King George of Great Britain. Spying, in other words, was the order of the day as General George Washington needed to keep tabs on British (and Hessian) troops stationed in (and around) New York City, as well as counter the activities of British spies who moved clandestinely amongst a local populace of unknown allegiance. 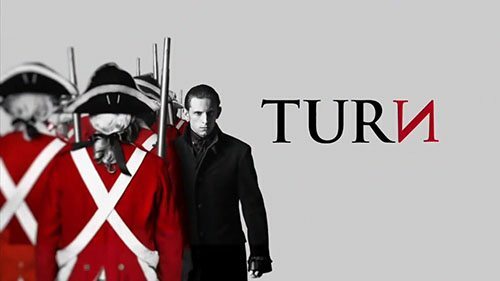 Thus the overall theme for AMC’s period-piece drama, “Turn: Washington’s Spies” -- a (highly) fictionalized drama of the real-life “Culper Ring” that was created by George Washington and organized under Major Benjamin Talmadge (played in the series by American stage and TV actor, Seth Numrich.) The story revolves around Long Island farmer, Abraham Woodhull (played ironically by an English actor, Jamie Bell), who reluctantly becomes involved in espionage, which is helped along by the fact that his life-long love, Anna Strong (played by Heather Lind) has thrown her lot in with Washington’s spies. 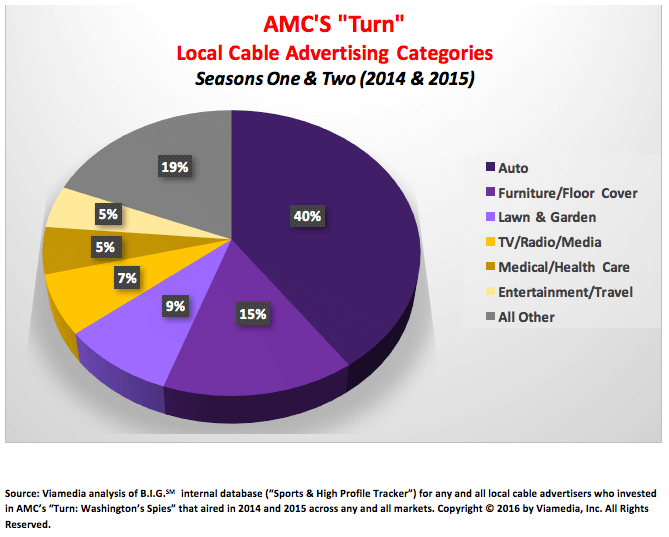 At first glance, it would appear that “Turn’s” audience has turned in the wrong direction as it enters its third season (April 25th premiere date.) 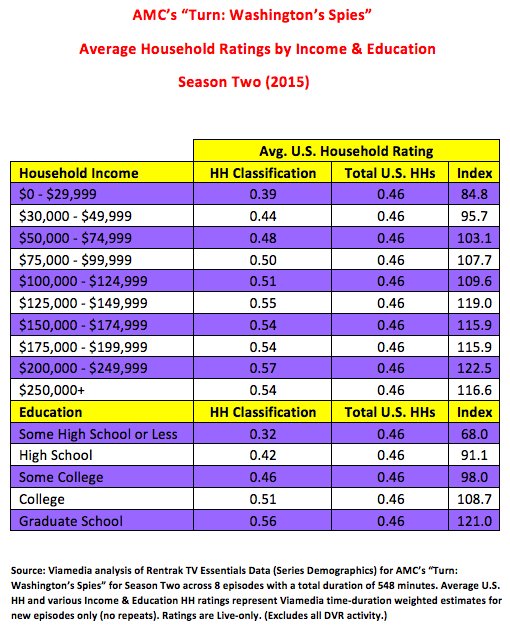 In Season Two (2015), average U.S. Live household ratings and shares were down significantly from Season One (2014) -- but the double-digit audience erosion comes with at least two major qualifications. 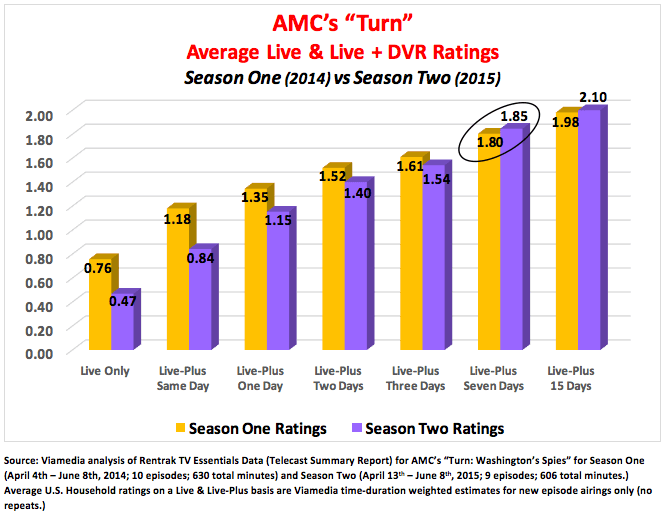 For one thing, the show’s premiere season aired on Sunday night at 9:00pm, which is a much higher HUT evening (i.e., percentage of Homes Using Television) than “Turn’s” Season Two time slot of Monday evening at 10:00pm. Based on our analysis of Rentrak data, there’s a 22% fall-off in HUT, which had a significant (negative) impact on ratings. The directors and writers of “Turn” have captured the zeitgeist of our nation’s Revolution in their main character – the reluctant Long Island farmer (and spy) Benjamin Woodhull. The popular modern-day view of our nation’s fight for independence doesn’t always square with what actually happened when war finally broke out in the American Colonies. Roughly one-third of the population remained loyal to King George, while another third rolled the dice and threw their lot in with a total break from the mother country. The remaining third occupied a very uncomfortable and ambivalent position between the two sides, not knowing exactly what to do and only praying for an end to the chaos and bloodshed that had descended upon our land. That is the “No Man’s” land occupied by Benjamin Woodhull until he is “turned” and begins to fight for Independence in a very unconventional way.